Our polymer bonds have the same attributes as your own hair & scalp and have been developed to gently hold to the hair without causing any damage. Pre-bonded extensions can be very discreet & help move with your own hair to give a natural look and feel. During application, the bonds are also moldable & can be formed into either a flat or round shape. Precision application by a Gold Class trained professional extensionist will make certain that the bonds will be virtually undetectable & very comfortable. Expert Gold Class Extensionsists are fully trained to assess exactly how many bonds will be needed and where to place them to give you the look you crave. 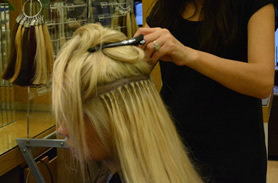 Only your trained extensionist will be able to safely remove the extensions for you.